I am relieved to be coming out of this past week with my wits intact. My son and I caught a really nasty bug. My little guy had it much worse than me and he had a double ear infection to top it off. He was just so uncomfortable and not sleeping, which means neither was I. The good news is that we are both starting to feel much better, but man was that a doozy! It’s tough to keep sick little ones comfortable, especially when you are not feeling your best. I definitely had a few lifesavers that kept me on top of my game so that I could focus on him and all the mess that came with having a little germ farm walking around all week. Stay Hydrated. Sure, water is important, but my go-to drink is hot tea with honey and lemon. It always does the trick for me. 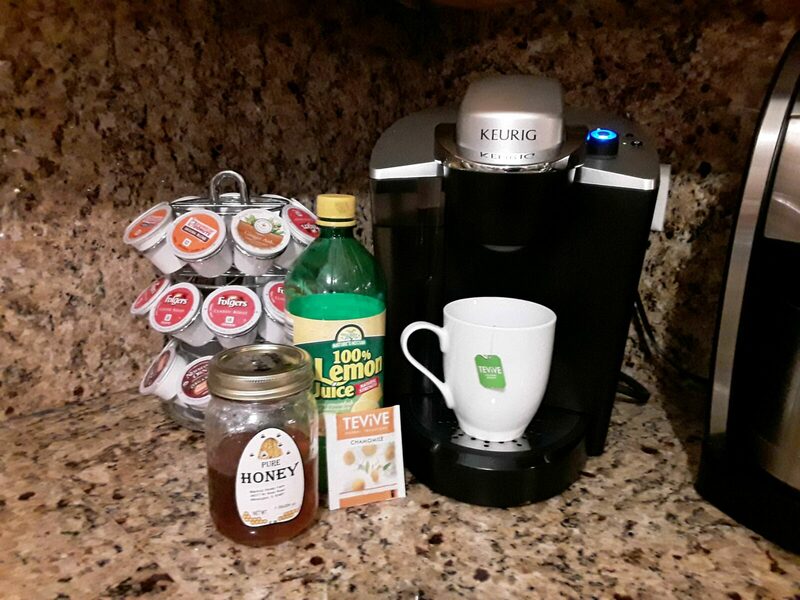 A little trick for ya; using a Keurig Coffee maker to dispense hot water for an instant cup of tea. Any herbal tea works for me. In this case(in my picture) it was late so I chose Chamomile. I use 2 spoons of honey and two cap-fulls of lemon juice(yep just be lazy and use the cap from the lemon juice bottle). You can add more or less to your liking. The lemon helps to cut mucus while the honey soothes a dry, scratchy or sore throat. I keep these staples in my fridge and pantry at all times to combat a cold the minute I feel it coming on! These all have a wonderfully long shelf life so they are always there when I need them. Get as much sleep as possible. As much as I wanted to stay up, I forced myself to sleep. This was important because I had no clue how many times my little guy would wake up during the night. Try to eat well but keep it simple. It was a week of comfort food for sure. I used my crockpot quite a bit. Loaded Crockpot Cheesy Chicken and Ham, Crockpot Cabbage Roll Casserole, Crockpot Chicken Enchilada Casserole, Crockpot Potato Soup…these all hit the spot. On one of our worst days though, we had Ramen soup for dinner. That was honestly one of the best meals out of all of them, so no need to get fancy. Since I was sick, I used things we had on hand in the fridge and the freezer. It is best to stay home and out of stores when you are coughing and sneezing, so as not to infect others. Gargle with warm salt water. I use about 1/2 tsp salt to 8oz of warm water. You won’t be able to get a little one to do this, but do yourself a favor and take the time to do this. Post nasal drip is no joke on the throat and nasal passages. This little trick eases a cough, relieves sore throat pain and inflammation and helps loosen mucus. Be forewarned though…it’s nasty. Do it a couple of times a day until you feel back to normal. This is something my Mom and my Grandma always did. My Grandma added vinegar to her mix, but I just can’t do the vinegar for some reason. I feel the salt works well by itself. Why not try this? It works, it’s always available, and it’s practically FREE(which I like even better). Use a Vicks Humidifier or a Cool mist humidifier(Note: Not all Vicks Inhalant products are okay for young children, so read before use) I placed the Vicks humidifier in the hallway between our bedrooms so that my son and I could both benefit from it. It really helps for all that mouth breathing you do when you are stuffed up. It’s an extra step to do before you go to bed, but so worth it. Clean, clean, clean so you do not get sick all over again or infect other family members. My hands appear to have aged 20 years from all the hand washing. Give yourself a pass and let the dishes pile up a bit. I’m gonna admit I absolutely did this, because I’m a real person. What’s the point of putting away a clean dish if you are just going to germ it up by sneezing and coughing all over it? Batch them for when you are able to control your body a bit. For the first few days, the kitchen was a bit gross. We are back to normal now, sort of. Disclaimer: I am not a doctor, so this is not medical advice. Just sharing what works for me, folks. Consult with a doctor if you or your child are seriously ill.